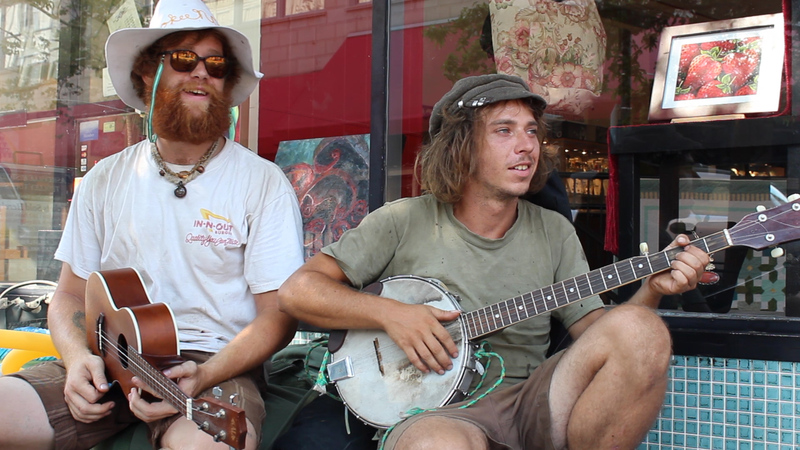 It was scorching hot on the streets of Asheville when I met Patrick and Cody, but you’d never know it from how chill these two were during the recording. They were hanging out in the shade in front of the Woolworth Walk, brought there by local busker Charles Clyde Toney II, and all three were performing together as I approached. It was so miserable out that I bought the trio some bottles of water from inside, figuring that they’d be more inclined to give a good performance if they weren’t completely parched. After a few false starts (turns out the three didn’t know each other’s songs very well), Patrick and Cody started talking about a tune they’d only come up with the night before. They didn’t have lyrics for it yet, were far from naming it, and had only a vague idea of how they wanted to end it. Cody also explained that it’s actually much better when he plays the kazoo with it as well, but it was so hot out that he didn’t feel like digging around in his pack to find it. While I was able to get all three playing together for a few songs, this would turn out to be the real gem of the session.